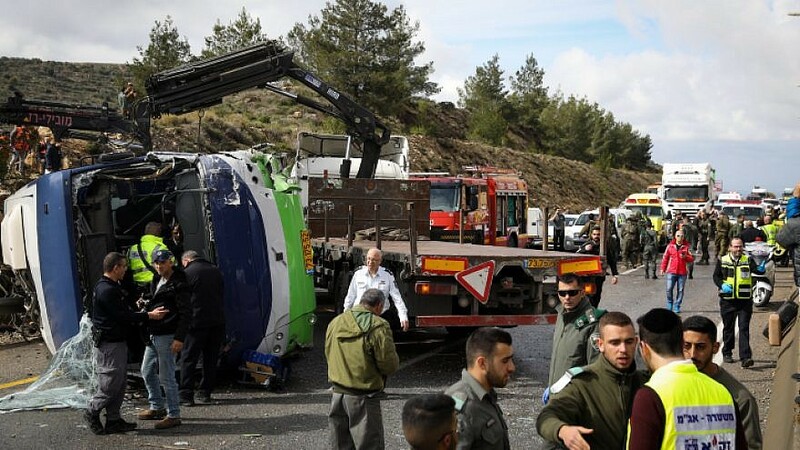 Israeli rescue forces and security forces at the scene of a car accident between a bus and a minivan on Road 433 near Modi’in on Feb. 10, 2019. Photo by Noam Revkin Fenton/Flash90. Early reports indicate that the bus slipped on the wet road and hit a car, causing the bus to hit the median safety railing and land on its side. (February 10, 2019 / JNS) Two people were killed when a bus overturned on Highway 443 on Sunday morning. An additional 41 people were injured, including five moderately. Previous articleUZI BODNER: NEW ALBUM!